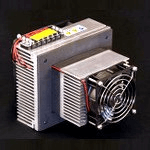 Please review all technical information & FAQ’s posted on our web site before purchasing thermoelectric modules. Selections shaded in blue are standard stock items. These items are stocked in prototyping quantities and can generally be shipped within 24-48 hours. Selections shaded in gray may or may not be in stock. Please inquire for stock status. If you are interested in a module that is not standard stock or otherwise in stock then a 100 piece minimum order applies. Please click here for Moisture Protection & Ruggedizing. 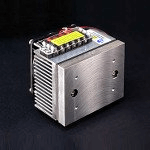 TE Technology’s cooling assemblies have the thermoelectric elements already built in, eliminating the need for you to design your own heat sinks and cold sinks. Our cooling assemblies have their thermal performance already characterized, eliminating the need to build and test yourself. Temperature controllers are available for both cooling and heat/cool applications. Epoxy Perimeter seal is available on all models. Seals out moisture and adds mechanical strength! 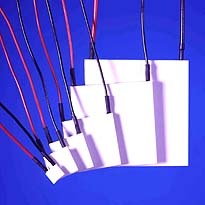 Standard modules offer the highest quality in the industry with excellent thermal performance. Our proprietary “potting” for moisture protection and ruggedizing is available as an option. These modules are rated for use up to 80 C.
Note: This is also sold as the HP-127-1.0-1.3-71 which can be found under the High-Performance section. Note: This is also sold as the HP-127-1.0-0.8 which can be found in the High Performance section. Note: This is also sold as the HP-127-1.4-2.5-72 which can be found under the High Performance section.